OK... from years ago when I built the patio enclosure around my pool I put in speaker wire back to a central point. More recently I wired up some outdoor speakers to the wire. I figured - oh this will be easy, just buy an amp and we will have music at the pool. For a long time we made due with pandora playing through the TV over a roku but some times it would be nice to crank it up. What I'd like is an amp with an easy way to feed streamed music from all sources, pandora over my internet, from a media device, whatever. What I'd LOVE is a way to run surround sound out there too (in fact I do have 5 speaker wire pairs in place but no way to drive them). What didn't I google looking for this? Someone must make it but it seems not? SONOS makes amps and self powered speakers that can all be connected together on its own network and driven by an app on your phone. It integrates everything, Pandora, slacker, prime, Google play, your music whatever. It can play the same thing everywhere or different things everywhere. It is great! But, is not cheap. Get a Sonos Connect amp for your outdoor speakers and it should do what you want for music. If you want 5.1 for the TV, that's going to be more complicated (either require significantly more Sonos gear, or you're looking at an AVR instead of the Sonos). Any modern receiver will do that. Most are bluetooth enabled and some even have pandora and spotify installed. I’m using the new Sonos Amp (not the older Connect Amp) for my outdoor speakers and it’s great. But as Brian said, it’s not cheap, and just about any modern receiver will feed 5 channels and handle streaming sources (though I don’t know off the top of my head if they will play from a local media device — I do that with Sonos). I have a couple of Denon AVRs and both support the popular streaming services. @jimim will get jealous if he finds out about this thread and he wasn't invited. BTW - I always thought your username was jimjim so I couldn't find it at first. We have the Sonos system and couldn’t be happier. Since you already have speaker wire run, you can buy just about any receiver/amplifier made in the past 5-10 years. I have a few Onkyo receivers that I bought on Amazon doing exactly what you are describing. The ones I have utilize Chromecast, so you use your phone/tablet to connect to your streaming service (I use Spotify) and then with a single click you "Cast" the music to the receiver. Onkyo has a decent app that you can use to control the volume and other sources as well. This one would be able to power your TV setup on Zone1 and then use another set of speakers to stream on Zone2. If you don't want to spend $500+ for a Sonos amp, you might look at the TIC AMP 50...it's $169 on Amazon and in my opinion works pretty darn well. They have a 4 channel as well for $249.00. I have found that the Bluetooth range is excellent and for the most part, I am not having to use the Wi-Fi; but it's there and works well for longer distances. Since you want surround sound along with stereo you need a receiver. Look for any 200 dollar wonder out there. That will make due for surround and stereo. If you need more power buy an external amp and then you can play louder, cleaner. Like Brian said most have media services built in now and app control. If not throw on a chrome cast like someone else said and you are good to go. Biggest thing is being able to control the receiver via app so you don’t have to go back and forth. sonos wouldn’t work for you if you want surround. If just stereo. Ya sonos. It’s a 1 stop shop so I think it’s worth the money at that point. I have my Amazon Fire stick inserted in the back of my Onkyo receiver. That way I am able to stream Pandora & Amazon through my TV.......AND THE ONKYO WILL CRANK IT UP!!!!!!! I'm using google home max, gives me voice control all my apps including pandora, spotify, google music, etc, + home control, and a pretty loud speaker (too loud for me to max it out in my neighborhood). $300 or less if found on sale or ebay. You can use multiple and pair them as well. Here is an inexpensive way to power it but only in stereo. THANKS. Those solutions make perfect sense and hit a range of price points. I see why I had been blind to them actually... a while back I got a bluetooth adapter for my older ONKYO and it turned out to be junk, so I was kind of sour on bluetooth to amps. Our most recent set of media upgrades were ROKU for all the TV which works far better than I ever would have guessed and means no more running coax and/or hdmi cabling all over. I realize though that one bad experience with bluetooth is a one off since it works fine in the car and elsewhere... I guess I totally missed that the modern amps have the streaming built in, should have guessed. The last TV and last DVD player I bought had streaming but I skipped it since I prefer the integrated approach and common UI of the ROKU. I use Harman Kardon for my AV system. I also have Roku on all my TV’s and Sling as my cable provider. Outdoor speakers never last long here in the south with our extreme humidity so I purchased a Pyle PA system that has Bluetooth. I just roll it out when we want music. It was cheap and works perfect. It has far outlasted previous outdoor speaker since it is not exposed to the elements year round. During football season I run the audio out from my outdoor TV to it. 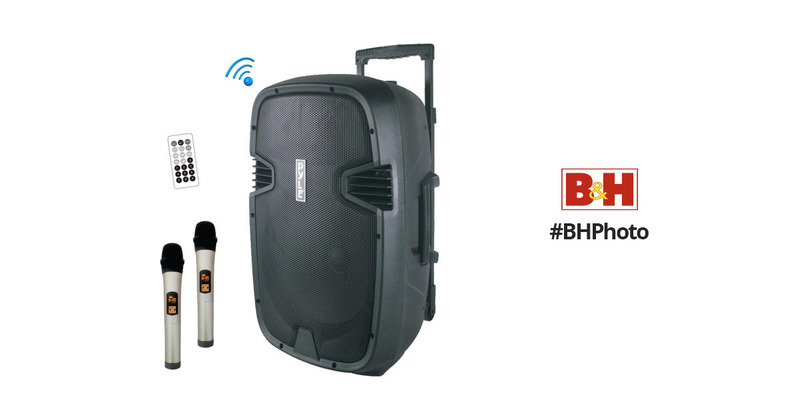 It can get very, very loud for large parties if needed. It can really annoy neighbors so be careful.